When I was in Paris, going around places of attraction requires a lot of walking – and it can be really tiring. So after a long day of walking, I always look forward to going back to Dieu! Lol, you din find out what ‘dieu’ mean?? Hotel dieu some more. Make it relate to more ham sap things. BTW, have u been DIUed in paris ? i hv dream to go there but no money no talk hahaha.. by the way, enjoy your trip..
Hahahaha…. diu… gam yong dou tak? Hi Ken, like the song, I love Paris. Its a beautiful city, and love the small cafes, sit drink coffee watch the World go by. Regret my Chinese gone kaput, ha ha. i always look forward going back to the LOO instead…kekekeke. Dieu!! So what did you do there? Dieu? LOL!!! owwhh just tell laaa what does it mean???? Hmm.. isn’t this sign along Rue du Bac, near my favourite cafe, La Fregate? u stayed there? so must be very busy… hahhahaa..
u go back wanna dieu apa? :P lulz! Wow! This must be one of your shortest posts! 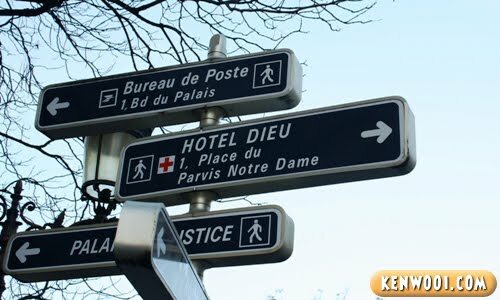 After a long day of walking you go back to dieu? naughty naughty. LOL! that word how to read??? oh my, did you find anything nice at Dieu?? do stop me from google-ing the word..
ahah! i got a gist of what it means! first time dropping comment here..
Not fair eh =3= Too lazy to get and ask people.